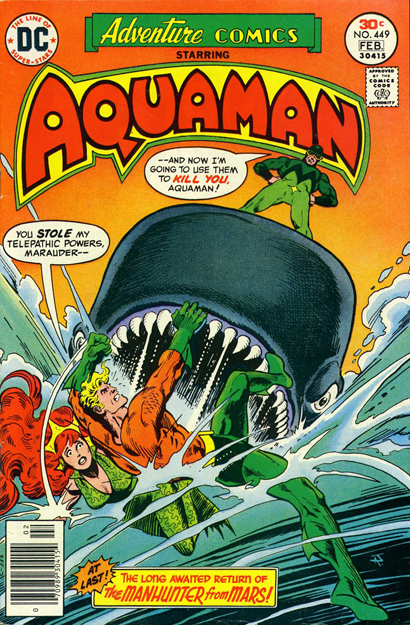 Our fifth installment of Know Your Aquaman Villains focuses on what would have been a footnote in the history of the Sea King if not for a new version that came to eclipse the original. We're talking about The Marine Marauder! The Marine Marauder came to us fully formed as a super-villain, a crook who can command whales via a transmitter built into his costume. After stealing the cargo of a passenger ship, Aquaman gets involved. 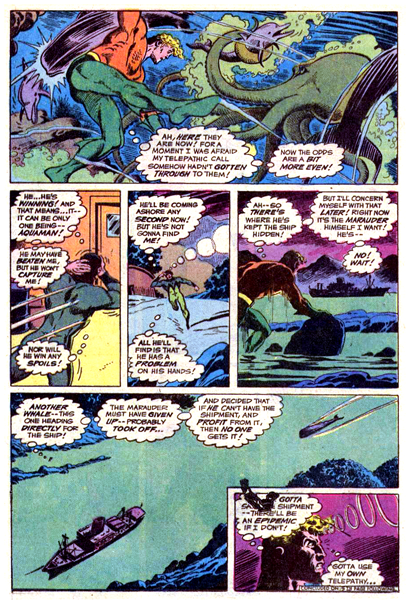 During a scuffle, MM commands a giant whale to swallow Aquaman and Mera, who get spit out only after the Sea King overrides MM's command. This Marine Marauder (beautifully drawn here by Ty Templeton) has an unnamed brother whose money she used to further her career in oceanography. It's safe to assume this is the original Marine Marauder, but it was left vague. Marine Marauder and Orm are defeated, and that was pretty much it for the character. Unless I am mistaken (always a possibility), the character has not been seen again. 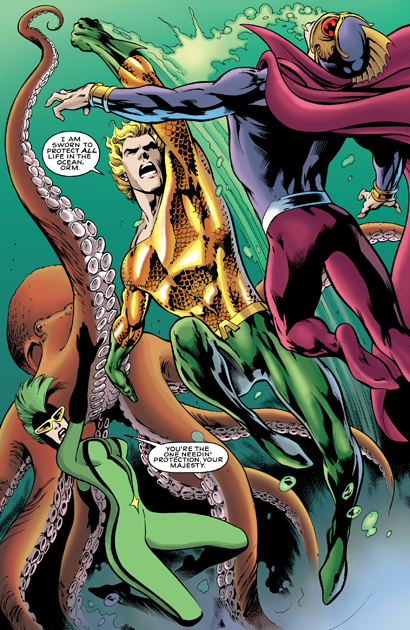 Which is too bad--considering how thin Aquaman's Rogues Gallery is (though there's been some solid additions to it, post-New 52), I've always though the Marine Marauder had real possibilities. I think the costume is sharp, the power set is cool, and the whole idea of a sister taking a villainous cue from her brother is a nice hook from which to hang a back story on. Maybe something happened to the original, post his scuffle with Aquaman, that led the new version on a quest for vengeance. That kinda stuff is always fun. In any case, the Marine Marauder is still out there, lingering in DC's massive list of copyrights. Any writer could pick him/her up and dust them off. What say you, Dan Abnett? If you can bring back Black Jack, the Marine Marauder ought to be a snap! 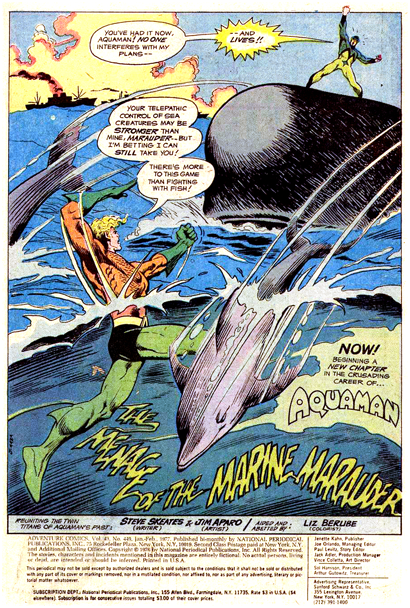 Marine Marauder I created by Steve Skeates and Jim Aparo. 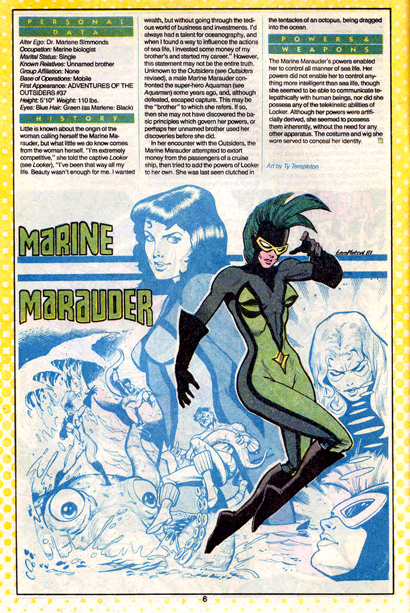 Marine Marauder II created by Mike W. Barr and Trevor Von Eeden. Wasn't there a Marine Marauder that was part machine and all red? *MM appeared as a member of The Society in Infinite Crisis.